“Shades of Gray: A Novel of the Civil War in Virginia” by Jessica James - Jimmie Aaron Kepler, Ed.D. Let me start with a confession. I am a man. 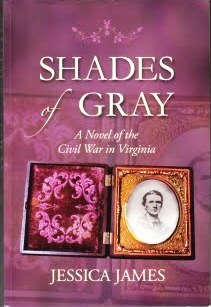 I read Jessica James’ “Shades of Gray: A Novel of the Civil War in Virginia”. I found the book interesting and engaging. I liked it! The story is about Andrea (Sinclair) and Hunter. She is a southerner who works as a Union scout while hiding under a floppy hat impersonating a young man. Hunter is the confederate Cavalry commander. The beginning and ending of the book were excellent and deserve five stars. The middle part of the book slowed down a little for me. A lack of action and repetitiveness had the middle lacking the magic found at the book’s beginning and end. I pressed on in my reading because of all the great reviews and awards “Shades of Gray” had received. I was wondering what I was missing. I am glad I continued reading and finished the book. The last third had me turning the pages and unable to put the book down. The story line is Andrea is the Union scout with world-class horseman skills that gives Hunter fits. Andrea saves Hunter’s life. Their fates become intertwined. She goes to Richmond as a spy posing as a Southern woman. She is captured and reveals her true identity as a Unionist. She spends time in a dreadful prison. Eventually, she ends up near death under house arrest in Hunter’s home as he makes good on a promise (read the book to find out!). Andrea and Hunter are inflexible to an obsession. Andre has a volatile temper. She and Hunter have a clash of wills and wits. Their attraction for each other builds throughout the novel. They finally admit their feelings, and nothing but difficulties come their way. About this point, the book grabbed me with their fighting and the plot twists where I just read the book straight through to the end. Jessica James’ novel is very good. I am a Civil War buff, holder of a B.A. degree in history, former U.S. Army officer and reader of over a hundred books about the Civil War. That said, the book is up there with the best I’ve read on the Civil War. I am glad I continued through the middle and finished the book. Even guys will like the book! “Shades of Gray: A Novel of the Civil War in Virginia” hit number one on Amazon.com in the romance/ historical category, beating “Gone with the Wind”. Jimmie Aaron Kepler is a novelist, poet, book reviewer, and award-winning short story writer. His work has appeared in over twenty venues, including Bewildering Stories and Beyond Imagination. When not writing each morning at his favorite coffee house, he supports his writing, reading, and book reviewing habit working as an IT application support analyst. He is a former Captain in the US Army. His blog Kepler’s Book Reviews was named a 100 best blogs for history buffs in 2010. You can visit him at http://www.jimmiekepler.com.